Here are the instructions for recording your words for the His Hands Reader lexicon. Any Skype quality noise canceling microphone will do. I use a Logitech headset microphone. Please contact me and I will give you a link where you can upload the voice files to. BobAchgill(at)hotmail.comThis is a link to a release form that you will need to sign and send back to me. This give me permission to use your voice as we distribute the His Hands Reader program and videos. 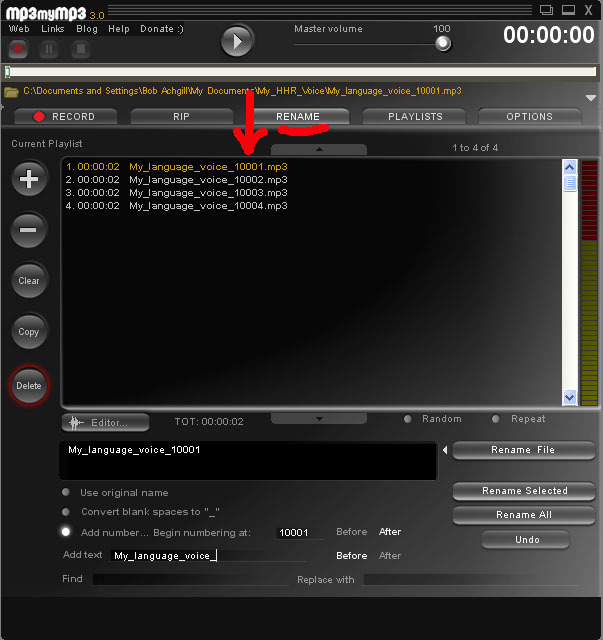 2) Install the MP3myMP3 program to your laptop computer. If you can use a laptop the quality will be much better because they usually have no fan noise. Note: During the install you may choose to DECLINE the installation of bundled 3rd Party Software that the developer of MP3myMP3 offers. Declining does not affect the operation of the voice recording features. The 3rd party program is included as an option for the developer to make some money so he can keep the MP3myMP3 program free. See how the Decline message appears in the picture below so you will recognize it when installing the MP3myMP3 program. 3) Now that you have the MP3myMP3 program installed ... please go to the OPTIONS tab. See the picture below. 4) Now select the RECORD tab. Make sure the DEVICE and INPUT are correct so that they match the microphone you are using. Set recording volume slider to 100 percent if a laptop. (Most laptops have weak microphone amplification) For desktops you may need to set the recording volume lower. When you speak into the microphone does the sound meter go into the red zone? If so then back off on the volume slider to prevent from getting clipping or crackly sounds in your recording. Now you are ready to record! Press the Big Record button and say the next word from the HHR lexicon followed by being silent for a second. 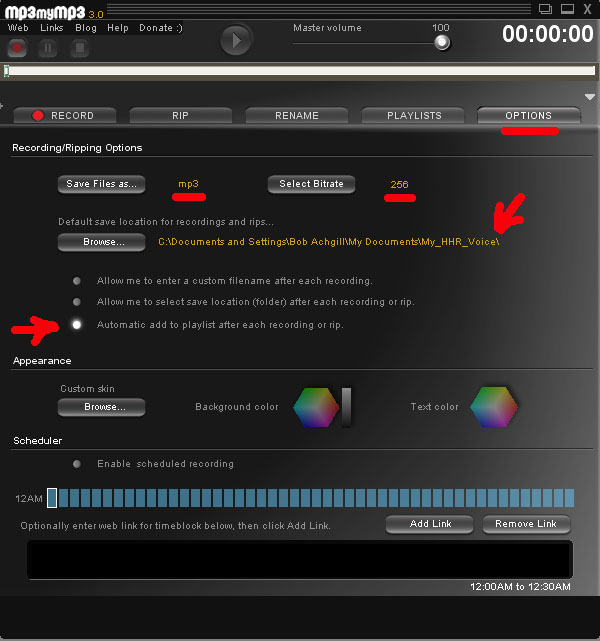 This silence will automatically trigger the stop and file save of the recording. You should see that a file appears automatically in the play list. Speak clear and loud like you are talking to someone across the table from you but not too loud so that you still sound natural. Drink water not milk to keep your voice clear. You can listen to what you have just recorded by selecting the file in the play list that was just recorded and press the play button top center. 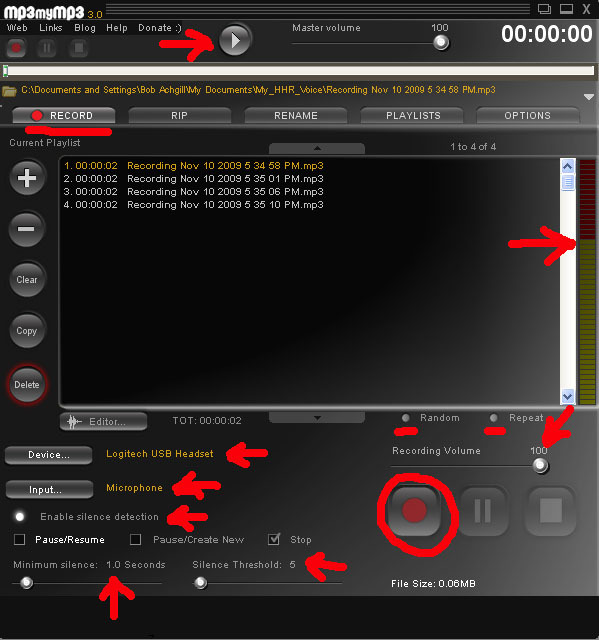 Choose the Repeat button to play only that file over and over or uncheck it and play all the files in the list. 5) Now select the RENAME tab and rename all the lexicon words you have just recorded using a sequential number that matches the lexicon numbers. Doing this step will help you identify if you have any skips or doubles on recorded words. 6) When you press the Rename All button (see picture above) you will get a renamed playlist of voice files like this below. I suggest you record 1 through 100 and then rename. Then record 101 through 200, and use "10101" as the beginning number, etc.. Be sure to record a couple of seconds of silence when there is no translation for a line in the lexicon to fill that empty place so that there are no skips. You will want to begin a new playlist for each 100 voice files because the mp3Mymp3 program does not like to hold 200+ names in a single playlist. 7) When you have recorded all the lexicon words and renamed pass them back to me on CD or DVD. 8) We will then use a program to automatically rename the 1742 mp3 files to the names that the His Hands Reader program will recognize. For this to work correctly there needs to be no skips or repeats in the sequential files. We will also trim off the front and end of the mp3 voice files so they have a standard amount of silence on each end. We will also fine tune the volume loudness so that they match the loudness of all other HHR voice files from other languages.